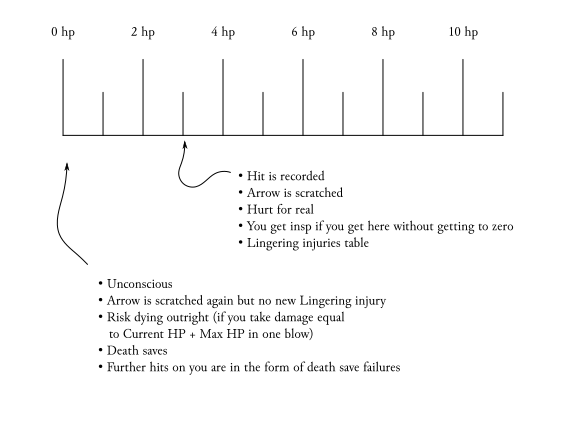 Our group uses the optional rule from the DMG that you take a lingering injury when you hit 0 HP. That means that HP is all fencing around and fun and games until somebody loses all of it, and a real “hit” is recorded at 0 HP. But a drawback is that we lose out on the trope of being damaged but awake. With our rules, you feint the same second you get your leg chopped off. The same goes for the pretties, they’re unhurt & happy & healthy until they go to 0. Zombies have their own rules for this in the Monster Manual and there are also some traps and attacks that kill outright at 0 hp. And of course when a pretty or other non-player-character dies the DM can choose to not roll death saves and instead have them die right away and that’s what I usually do to save time. There’s been some exceptions like Baba Lysaga from the CoS campaign or Imete and other friends of the hobos. The DMG also gives the option that you might get lingering injuries on crits and when you roll 5 or lower on death saves. But that’d give way too many lingering injuries, wouldn’t it? The new rule separates the injuring hit from the hit that makes you faint. You take the injury when you hit your wound threshold. If you do take a hit without fainting, you get 1 insp. You get it in time to use on the lingering injuries roll, but you don’t have to use it for that, you could also use it for other things such as striking back at your foe (adrenaline rush!) or creating drama. 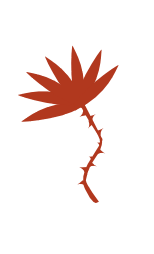 Here is an example with a wound threshold of 3. You take the lingering injury when you go from strictly over your wound threshold, to at or below your wound threshold. The default wound threshold is 1. Going down to 1 HP exactly should be memorable enough that most people, even new/guest players or those who don’t like to engage with a bunch of rules, might take note of it. You can record any wound threshold, as long as it’s strictly lower than your max HP, at character creation or at level up. (When you level up you might lower or increase it as you wish.) 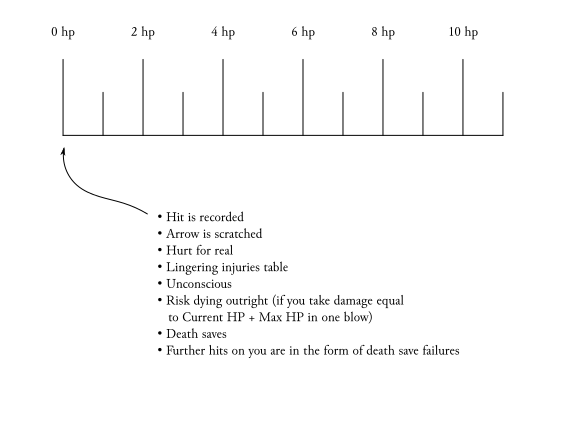 (Setting it to 0 means that you always faint from any wound — just the way things worked before the wound threshold rule was introduced.) However, you need to keep track of it. It’s mandatory — when you go down to your wound threshold you have take the insp+wound, it’s not an optional deal. With a low wound threshold (such as zero), if you go down, get up again, go down, get up again — that’s a lot of lingering injuries. With a high wound threshold you’re not at risk of getting a new lingering injury until you’ve been healed to above your original wound threshold.